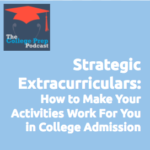 Do you worry whether your high school student has the right kind of activities to impress the colleges to which they’re applying? Megan lays out an easy way to think about extracurriculars to help teens make the most of their time outside of school. © 2017 by The College Prep Podcast	/ Proudly powered by WordPress	/ Theme: thebox by design news.